The immaculate and individually appointed bedrooms boast period wallpapers, antiques, private balconies, and individual heating and air conditioning. The guest rooms are located on the second floor of the home. Awaken each morning with coffee service just outside your bedroom door and the aromas of breakfast wafting from the kitchen. Enjoy your coffee on the balcony watching the sun rise or listening to the birds. Enjoy this feminine room with its outstanding period wallpaper treatment, fluffy queen bed, and private balcony which overlooks historic Virginia Field Park and its one-of-a-kind gazebo. This is southern hospitality at its best! The comfortable yet elegant bedroom with queen sized bed, unique Victorian fireplace and private balcony lets you step back in time. 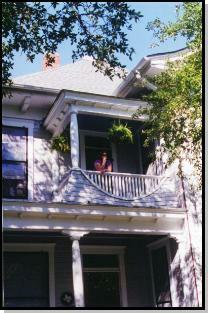 Open the window (it disappears into the wall) and step out on the balcony for a wonderful view of the grounds. History buffs love this room! The walls are lined with fascinating old photos of Calvert homes, businesses, and citizens. Revel in the spaciousness of this impressive room. Enjoy moments of quiet conversation in the private sitting area in front of the ornate fireplace. A night in this elegant room is guaranteed to calm the soul and then when you must, return to your hectic life totally at peace. This charming bedroom is decorated with old photographs and mementos of the Qualls family. Hang your clothes in the antique double armoire and snuggle in the queen sized iron bed and dream of a by gone era of grace, beauty, and elegance. 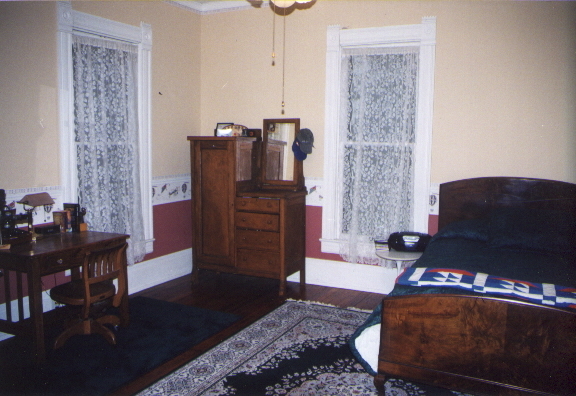 This bedroom is lined with early photos and documents of the Stricker-Sneed Home and the families that occupied the home. Some of the more famous photos include retired Federal Judge (Ninth Circuit Court of Appeals) JosephTyree Sneed. Unwind in this historical room and wonder ... Who else has occupied this room during the past 100 years? This room is currently not available.